This is the fourth year Emma donates to this charity. 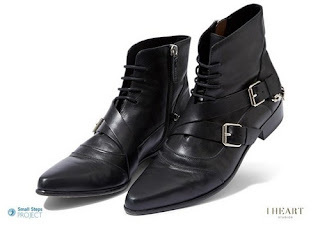 This year, she donated her size 38.5 black lace-up leather buckled ankle boots by Tabitha Simmons. I couldn't find an exact match of when she wore them, only similar ones when she arrived at the airport in Nice for the Cannes red carpet for The Bling Ring. Small Steps Project informed me the bidding will start on November 1. I'll post to link to bid then. New movie on the way for Emma Watson?